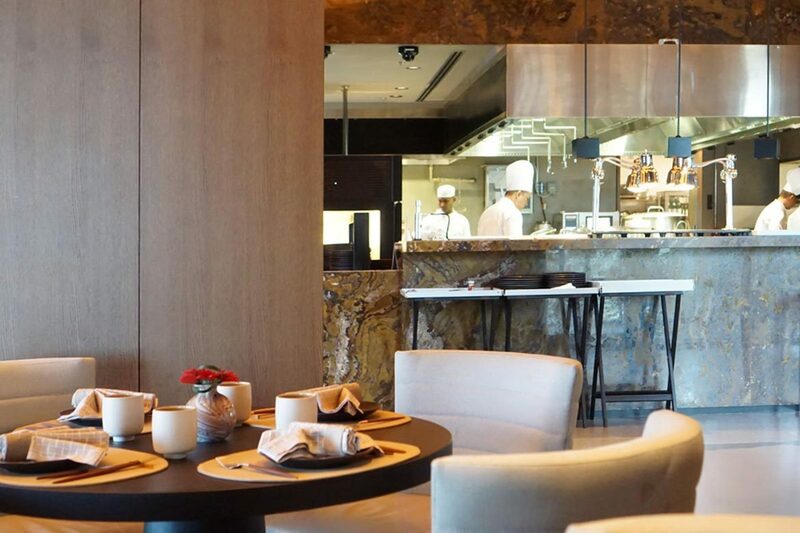 We’re always on the hunt for good Asian food in Dubai. 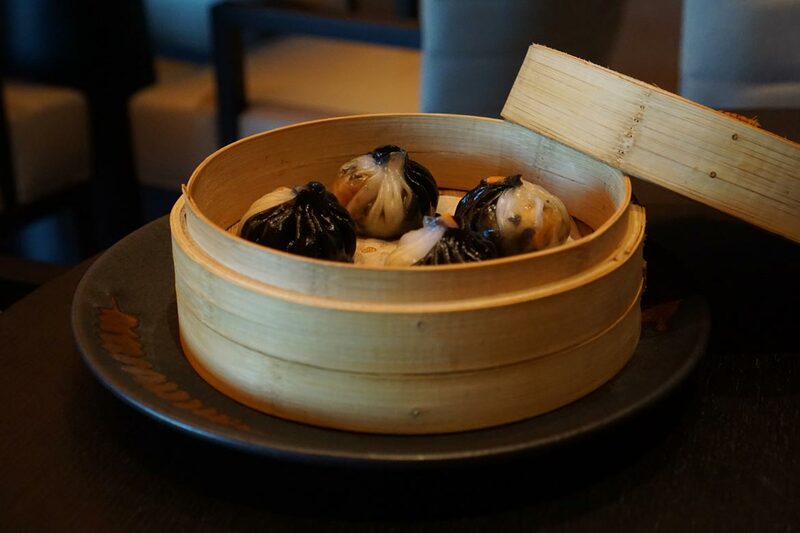 Given that we hail from New Zealand (where the Asian population is high and the Asian cuisine is goooood) and travel to Asia so frequently (sorry Europe, but our heart is in the East), we are constantly disappointed at the state of Asian food in Dubai. 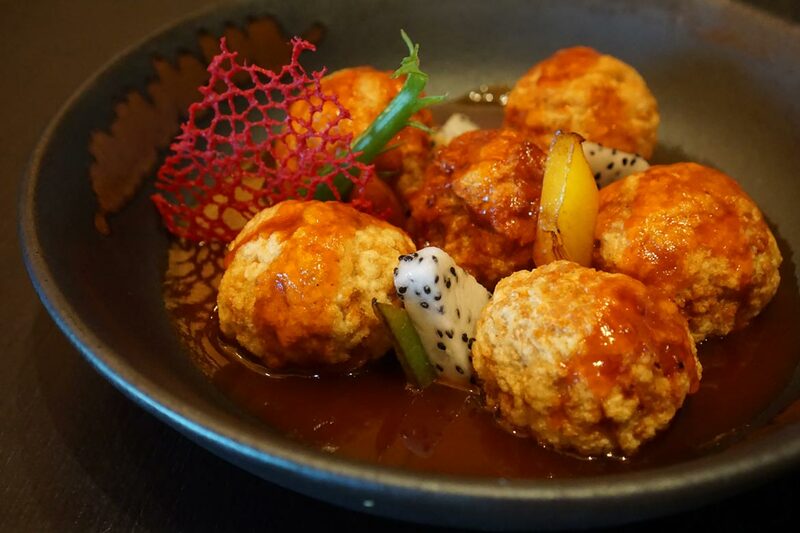 At the recommendation of our darling friend @hedleyhymers, we have been eagerly awaiting the opportunity to try out new-kid-on-the-block Zhen Wei, which hasn’t been easy as we’ve been told dinners have been fully booked of late. We’re the only guests in the restaurant when we dine for lunch (ok, a table of hotel guests came in towards the end of our meal) so if you happen to face a similar issue, perhaps lunch is the way to go. The downside of visiting Zhen Wei for lunch, however? The restaurant is positioned right next door to the hotel’s pools, and to be totally honest, we don’t want to stare at beach bodies while we’re eating. Not now, not ever. Obviously, this wouldn’t be an issue when dining for dinner, but at lunch, we’d have preferred if they’d drawn the blinds to make the setting cosier. We start with a couple of cocktails, as per usual. 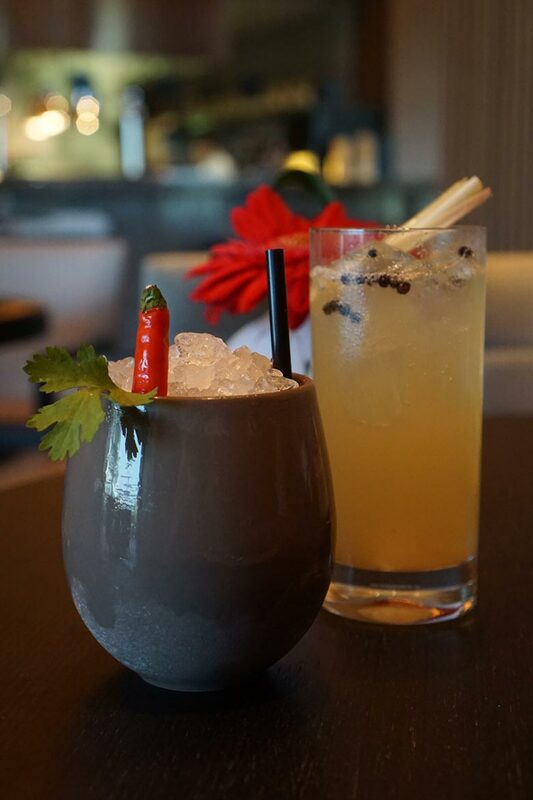 The China Swizzle (rum, coriander, chili, lemongrass, sugar and citrus) is very nice but given the volume of drink compared to the volume of crushed ice, we feel it’s pretty steep at 85dhs. The Flower of Flowers (Earl Grey-infused gin, lemongrass & pepper syrup, yuzu liqueur and soda) is not bad either, but again feels a touch overpriced at 75dhs. Staying on the beverage front, I am very impressed, however, to see that Zhen Wei is serving a Chinese wine by the glass. I’m always intrigued by China’s relationship with wine and it’s burgeoning wine industry, so I never miss the opportunity to try a new Chinese drop. The wine in question is from Chateau Changyu Moser XV, and rather surprisingly, it’s a white Cabernet Sauvignon. It reminded us of a New Zealand Pinot Gris and that’s very high praise. A great match for Asian cuisine. Well worth checking out at 75dhs/glass (but we’d say go for the bottle at 365dhs as the pours are small). 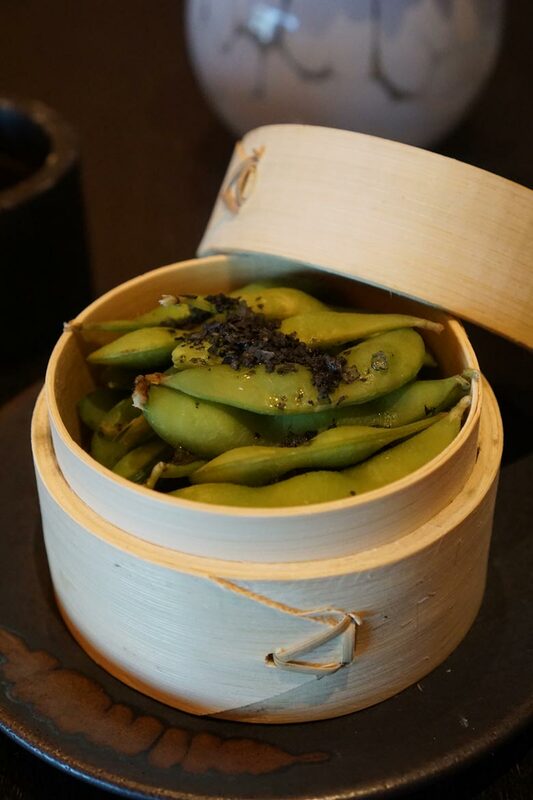 We munch on the Edamame with Hawaiian black salt (35dhs) while perusing the menu, and we’re relieved to find edamame in Dubai that’s not horrendously overcooked for once. Speaking of the menu, one of the main reasons we decided to check out Zhen Wei, in particular, was their menu. It offers (what seems like) a TON of non-seafood options, something you don’t see often in Asian restaurants in Dubai. Disappointingly though, they seem to add seafood ingredients to almost all of their non-seafood dishes. The only dim-sum without seafood ingredients were the two vegetarian options, the Jade 5-vegetable pot stickers with red chili sauce (55dhs) and the Steamed vegetable luo han gyoza (50dhs). Both are pretty good, if not anything particularly revolutionary (a huge improvement over 95% of dumplings I’ve eaten in Dubai, though). 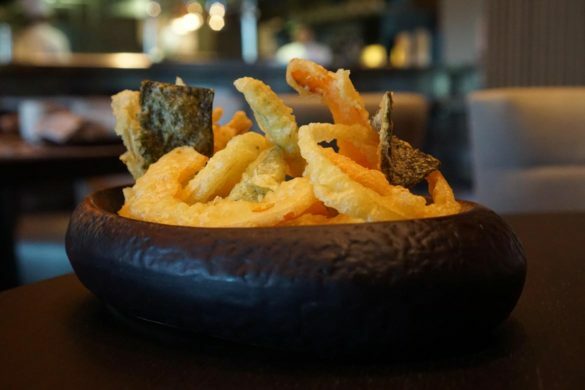 Still on the vegetarian train, we also try the Mix vegetable tempura with black truffle, Japanese mayonnaise (60dhs) and not only is it the best dish of the day, but it’s also the best value too. We’ve been to two-starred establishments in Asia that can’t seem to get tempura right, but Zhen Wei absolutely killed it with this dish. Superb. 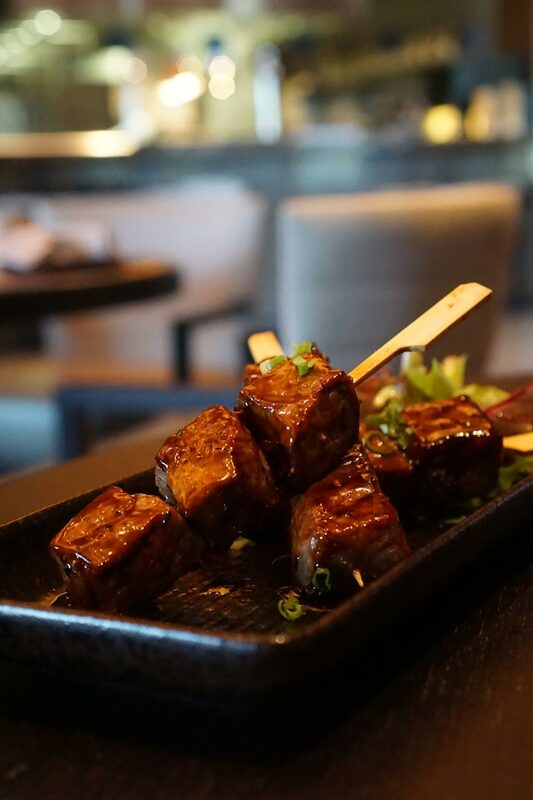 We go from hero to zero, however, when we try the Wagyu ribeye skewers (80dhs). They don’t really taste like ribeye, at all, and though we can tell it’s probably Wagyu given the fat veins (we’re told it’s 7+ marbling score), it’s not very good Wagyu. We asked for the name of the farm/producer many times but came up empty apart from being told that it’s Australian in origin. The flavour reminded us of old meat, and not in an aged way, and the texture was mealy and grainy. 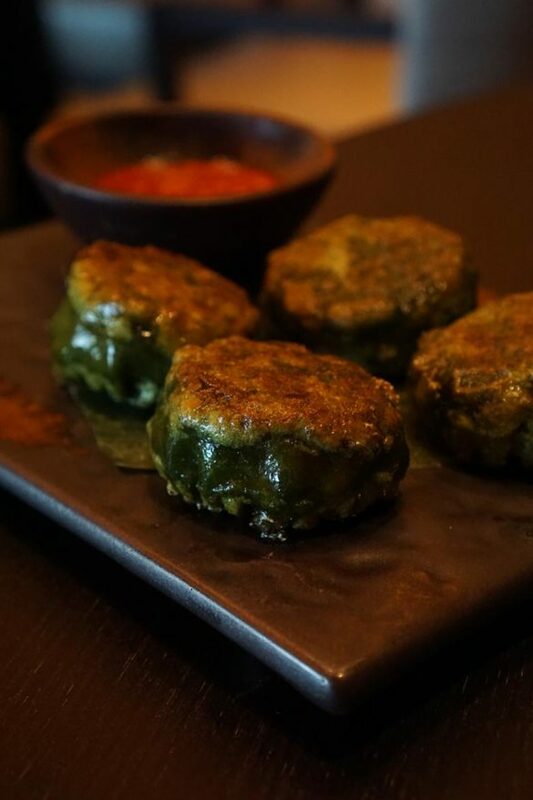 We hate to say it, but these were not good at all. We adore Wagyu and we really struggled to eat these. For mains, we start with the Sweet and sour crispy chicken (120dhs) and sadly, hit another unpleasant dish. It doesn’t really fit with what we had in mind from the menu description – in essence, it’s deep fried chicken meatballs in sauce. We’ll be perfectly honest. It smelled and tasted like chicken McNuggets with sweet and sour sauce dipping sauce. 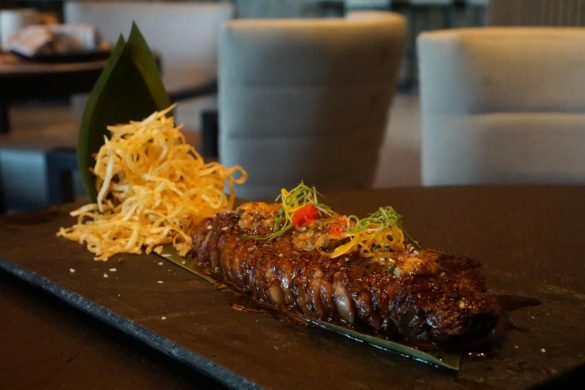 They seem aware of the issue with the dish, however, as we are told it’s being taken off the menu very soon – so hopefully, you won’t be tripped up by this one. We’re soon back on track, however, with Zhen Wei’s Peking Duck (225dhs for half) – it’s pretty darn good. The amount of cucumber and spring onion is generous (we’ll never understand why restaurants skimp on the cheapest part of the dish) and the meat is ridiculously juicy and plentiful. There are plenty of beautifully soft and supple pancakes too (two steam baskets full) and honestly, the only thing we could fault them on is that the skin of the duck is perhaps not as crispy as it should be. 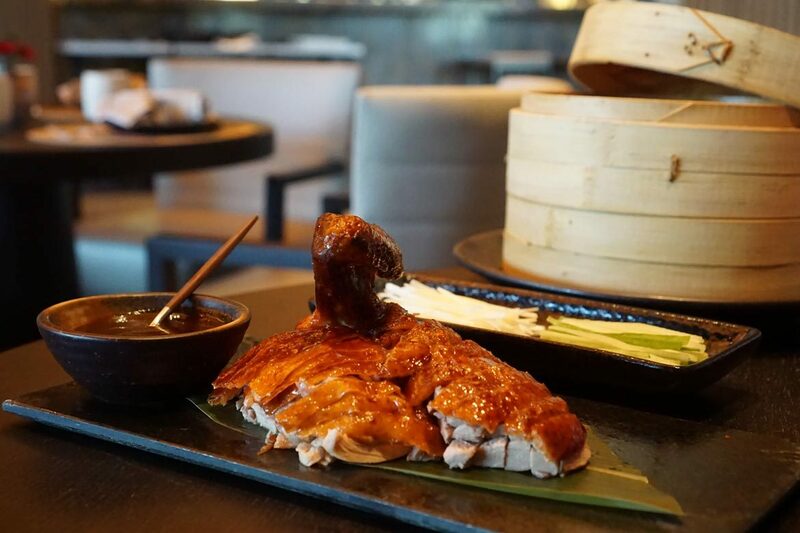 Other than that, it’s really very good Peking duck and thoroughly enjoyed by all at the table. We order the Szechuan Wagyu Striploin (330dhs) mostly in an effort to see whether the beef issue permeates the whole menu, or if it was just an issue with the skewers. Sadly, the same issues arise with the striploin – unpalatable flavour and texture. The Szechuan butter isn’t very Szechuan, and the potato threads don’t taste super fresh – on the whole, the dish is a pretty big flop, sadly. We attempt to sneak out without dessert but the chef insists we try their signature Cantonese papaya puffs (45dhs for four). 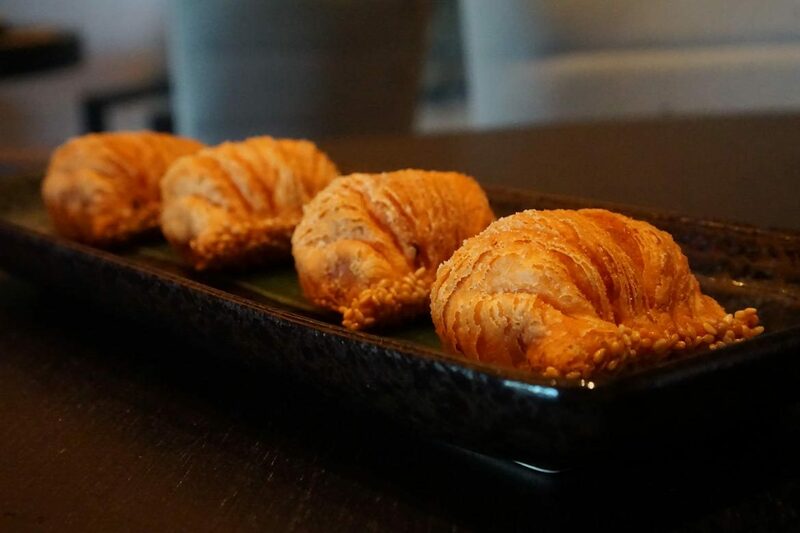 They’re actually rather fab – piping hot, flaky and fruity. We just wish they came with some custard or vanilla bean ice cream though – that would be a match made in heaven!